End each meal with your favorite single origin chocolate, shown here in tasting squares that are perfect to serve with coffee. All product photography by Dhanraj Emanuel. PETER ROT is the THE NIBBLE’s chocolate specialist. CAPSULE REPORT: Dagoba (pronounced duh-GO-buh, meaning “temple of the gods”) was founded in 2001 by “head alchemist” Frederick Schilling. His philosophy states, “You can deprive the body, but the soul needs chocolate.” Metaphysics aside, Dagoba creates some of the finest organic chocolate our tongues have ever encountered—dark chocolate and milk chocolate bars, hot chocolate, even delicious cacao nibs and chocolate drops for baking. In some instances, the products are Fair Trade Certified—a fact that should ease your conscience as well as feed your soul. The line is kosher certified as well. Dagoba’s product line is vast. Not only does the company offer 18 flavored bars, five plain bars and five single origin bars, but there are four different flavors of cacao nibs, three hot chocolate mixes, chocolate drops for baking, chocolate covered coffee beans, cacao tinctures and several other products to keep the most focused chocoholic busy for months. We’ll get to them below; but because Dagoba is a socially-concerned company, we’ll start with an overview of the often-not-so-glorious world that grows the beans that create the divine chocolate. If you don’t want to read this part, you can skip down to read about the chocolate. In today’s chocolate-obsessed world, you don’t have to go far to enjoy a high-quality, delectable bar of chocolate. Just about any gourmet food retailer stocks premium chocolate, and even grocery stores sell premium bars. In fact, you don’t even have to leave your chair—simply order online. While the efforts to buy fine chocolate are not arduous, the process of producing it is. Roasting the cacao beans, winnowing, conching, refining and molding the chocolate are complex processes, but they are only a part of the spectrum of chocolate production. What many people never think of are the farmers who grow and process the cacao, as well as the vast ecosystems in which cacao grows. Without the farmers and their diverse environments, chocolate would not exist. While THE NIBBLE focuses on only the finest chocolates, made from beans representing the top 10% of those grown, cacao is a commodity crop, traded and sold on a world market between brokers and buyers—brokers in the third world, where the cacao is grown, and buyers in industrial countries where the customers are. As with many other agricultural outputs, such as cotton, wheat and corn, the price for cacao can fluctuate according to worldwide demand, production, and other competing countries that flood the market with their own product. Each pod must be cut from the tree by hand, by machete. Since approximately 70% of the world’s cacao production is considered “bulk beans” (the commodity, not the good stuff), mostly all of what is grown is sold out of the control of the cacao farmers who produce it. Middlemen and brokers receive a piece of the pie for their efforts in getting the cacao from the farmers in remote agricultural regions to the end buyers (the manufacturers), further reducing the earnings cacao workers receive for their backbreaking labor. 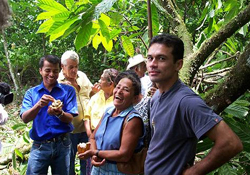 (The finer beans are sold by brokers, too, but often, chocolate manufacturers develop direct relationships with growers, paying top dollar to secure the best beans; and Fair Trade organizations work with other growers and co-ops to ensure that both the farmers and the environment are treated fairly). For the workers who labor so intensively to grow cacao, this market dynamic leads to a payoff that is far disproportionate to its investment. Growing cacao is an arduous task, demanding long hours in tropical humidity, hand pollinating flowers, warding off pests and in some cases, irrigating; then hand-harvesting each pod with a machete, hand-cracking it open, removing and sorting the seeds (the cacao beans), which are then fermented and dried. In Western countries, it is estimated that farmers receive a scant 20 cents of each food dollar, with the remainder going to transportation, marketing, processing and other related expenses. But the wages cacao farmers earn are so low, they will never be able to afford a bar of finished chocolate they helped to create. 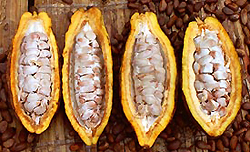 Like other agricultural crops, cacao demands expansive plots of land—and more and more of them, to satisfy the growing worldwide hunger for chocolate. Many rainforests are destroyed to make room for cacao plantations. To the unassuming eye, these plantations may look harmless. But nature has never created such sterile and artificial environments. Intensive agriculture,* on the other hand, does, and it depletes resources at alarmingly high rates, thus damaging the environment. Each cacao pod is then sliced open, and the seeds (beans) are removed from the white pulp, dried and fermented, before they can be sold. *Intensive agricultural production systems are characterized by high input costs in proportion to the total land area on which a farmer works. These systems rely on chemical fertilizers, pesticides (herbicides, insecticides and fungicides), mechanical plowing, growth regulators and other artificial means to increase production beyond the limit than what the natural ecosystem would normally allow. Instead of mimicking natural biological circumstances, the farmer creates artificial ones that do not return nutrients and resources to the environment. As a result, environmental changes are associated with these practices, such as wildlife habitat loss, soil erosion, alteration of aquatic biology, extermination of entire species of animals, etc. 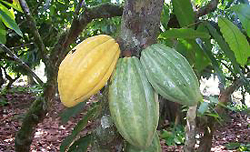 Adding to the problem is that large cacao-producing countries, such as Ghana and the Côte d’Ivoire, are often economically unstable, so intensive agriculture is often received with open arms. Cheap labor is commonly employed on plantations, sometimes against the will of the workers. The result of these circumstances is poverty among workers, who labor so strenuously in an environment they unknowingly destroy, little by little. It’s an unhappy story all-around, except for the brokers and middlemen who make profits by selling the beans. If you’re not familiar with the word “sustainable,” it implies a mode of operation that does not use resources from the environment at a rate faster than they can be restored. For example, a farm using self-produced manure to add nutrients and organic matter to the soil is said to be utilizing sustainable production methods, because incremental resources are not being used to create fertilizer, petroleum is not being used to transport it and the nutrients that plants remove from the soil are returned by it. Simply stated, resources removed from the environment are recycled back into it: a win-win situation for both the environment and the people who depend on it. Sustainable agriculture creates an ecosystem that people can rely on for generations to come, instead of eroding it. Part of Dagoba’s mission is to contribute to sustainable agriculture, to improve both the environment and the lives of the people who need to live off of it. After realizing that cacao production is too intimately associated with rainforest destruction and poverty among workers, Dagoba has been helping to ameliorate these conditions. The company always sources from small farms and co-ops, not through brokers or traders. Company founder Frederick Schilling regularly travels to cacao-producing countries to establish direct partnerships with the growers, collaborate on past-harvesting processing and learn more about how equitable cacao trading benefits both the ecosystem and the workers who cultivate the cacao. 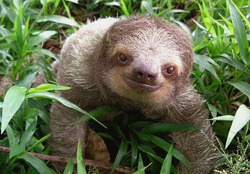 The sloth, a victim of rainforest deforestation, gets to keep his home through a wildlife corridor maintained in Costa Rica. These practices keep the relationship between grower and buyer close and friendly, ensuring a top-quality supply of cacao on a reliable basis. In turn, farmers are encouraged to continue sustainable farming practices, contributing to both the environment and the financial well-being of the workers. These efforts extend largely to several Caribbean nations and Madagascar. Costa Rica, for example, is the source for Dagoba’s Pacuare bar (68%) and also for several blends. Estate workers earn at least 1.5 times the minimum wage and enjoy health care and other benefits. The Costa Rican estate also boasts a wildlife corridor that provides shelter and habitat for species whose homes have been destroyed by development. Dagoba supports the farm’s efforts to provide root stock and offers technical assistance to workers who have lost their cacao crop to disease. The Dominican Republic is the source for the Conacado chocolate bar and Chocodrops (73%) and other products. Dagoba obtains its Dominican cacao through the Conacado Cooperative, a 9,300-member Fair Trade cooperative, which is incidentally the largest organic Fair Trade co-op in the world. Conacado has implemented a plant nursery, arranges workshops that teach processing techniques and organic farming, reserves funds to aid in recovery after hurricanes and even sends members to international trade shows for marketing purposes. Cacao farmers in Costa Rica, members of the Conacado Cooperative, enjoy a far better life than most of the world’s cacao workers. These are only two countries among at least three more where Dagoba provides assistance to both ecological and social well-being. However, Dagoba hasn’t lost sight of its social responsibility in America. Through various efforts in its plant and offices—such as extensive recycling, reducing, reusing, buying renewable energy credits to counterbalance energy used at their plant and upgrading cleaning supplies to biodegradable alternatives—Dagoba has been recognized by the EPA with a Green Power Leadership Award and membership in the Green Power Leadership Club. The packaging is recycled paper, using vegetable-based inks. Dagoba is currently working with its city’s (Ashland, Oregon) Green Business program to become a certified Green Business. 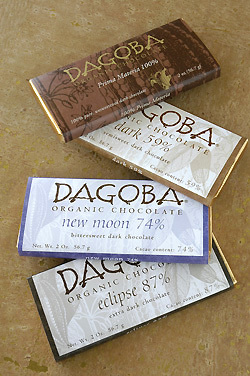 Dagoba made its name with organic-certified chocolate bars, bringing a new set of principles and standards of quality which raised the bar (pun intended) for the competition. Since 2001, the company has also helped to bring distinctive-flavored bars into the mainstream. A repertoire of 28 bars might seem daunting at first (“so many bars, so little time....”), but just think about it: That’s almost one bar for every day of the month. And they’re just two ounces. Not so much of a challenge—more of a pleasant way to plan the month (the real challenge is what to consume on the extra days—we’d recommend the nibs). 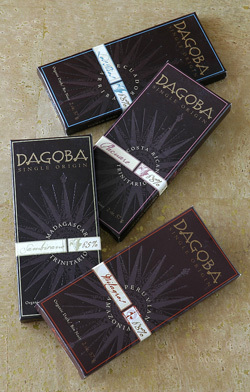 Dagoba is a line for people who are serious about their chocolate: Much of the line is dark chocolate. * There are a few high percentage cacao milk bars (37% and 39%), some semisweets (59%) and a lot of action in 68%, 74% and higher—all the way to pure 100% cacao. *Before we get letters of protest, we know there’s very serious milk chocolate out there, and we love it —just read our article on The Best Milk Chocolate Bars. From chai to lavender to rosehips, each bar is uniquely nuanced with flavor combinations that might seem unusual to traditional palates. But rest assured: The intensity of some of the flavorings is usually subtle, never domineering. The flavors tweak tradition by combining unexpected flavors. Lavender 59% adds dried blueberries, Mint 59% features mint plus rosemary, Roseberry 59% has rosehips and raspberries. But there’s no cacophony: The primary flavor dominates while the secondary one takes a back seat—the mint is prominent but the rosemary is a whispered accent, for example. The low-key interplay of flavors enable even the most conservative of tasters to enjoy these flavored bars. 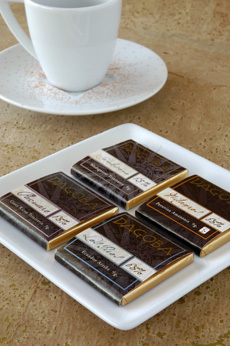 In all flavored bars, the strength of Dagoba’s couverture shines through: sweet milk or profound shades of dark chocolate. The newest flavored bars include Chai, Seeds, and Superfruit, with açaí, goji berries and currants. Instead of reviewing each of the 18 flavored bars individually, we’ll describe a few of our favorites. Because we prefer assertive flavors, we quickly took a liking to the more intense bars. But the best way to pick your favorite is by trying them all. After all, the best part of any road trip is the travel rather than the destination. Brasilia 39%. Coconut and macadamia nuts paired with milk chocolate make for what we think is Dagoba’s best-flavored milk bar. Although the nuts aren’t overly prominent, coconut flakes can be tasted subtly underneath the blanket of milk chocolate. This bar is by no means an explosion of flavor; rather, it’s soft, subtle and not too sweet, achieved by an extremely conservative addition of coconut. Because coconut can be a forceful flavor, perhaps Dagoba’s judicious use of ingredients paid off. Lavender 59%. Light and delicate lavender notes pair magnificently with chocolate, along with just a scant suggestion of dried blueberries. This is the ultimate feminine bar, yet its strength surprises due to the assertive nature of lavender. It might seem as if you’re surrounded by flowers! Roseberry 59%. The dried raspberries pack a beguiling punch, one that is neither too strong nor too subtle for the chocolate. Both components glide serenely for the entire length, creating an overall pinkish feel to the flavor, with the occasional spurts of red. The overall effect is quite charming and delightful, accented with occasional crunches of rosehips. It’s a soft bar (similar to Lavender), definitely recommended to those who want to feel coddled or consoled. Mon Cheri 72%. The dried cherries don’t seem to be mixed into the chocolate at all, but rather puréed and blended thoroughly—their flavor amazingly seems to be a part of the chocolate itself. Indeed, if one were not aware that fruit was added, this bar could be mistaken for pure chocolate with an inherent fruity profile, pleasantly acidic highpoints and deep, rich chocolate undertones. Energy 74%. This bar is part of the Apothecary line, “daily alchemy” that blends chocolate with ingredients known to provide extra energy (in this case), clarity, antioxidants, etc. Here, cacao nibs, green tea, guarana seed, rooibos, yerba maté and other natural energy-boosters were added. The flavor is redolent of dark fruits, with prevailing notes of prunes and grapes. 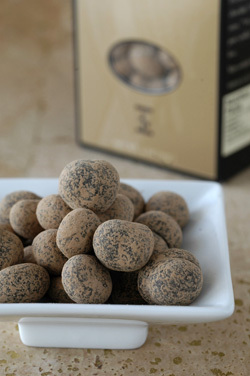 The chocolate delivers a robust flavor with a pleasant rawness from the nibs. Chewing releases notes of banana and fermented cacao spikes in bursts, in addition to a textural crunchiness that matches well with the intensity and bitterness of the chocolate. Whether you’ll obtain any more energy from this bar over another 74% bar is to be proved by science, but the flavor certainly is wild! Eros 74%. Chocolate is supposed to be the food of love, but this Apothecary bar ratchets it up with the alchemist’s recipe for romance. If you want to try it at home, infuse your food with boysenberries plus botanicals like catuaba root, damiana leaf, horny goat weed, muira puama root, prickly ash bark and yohimbe bark. The resulting bar taste like bright red fruitiness, more like a combination of raspberries and blackberries. The fruit remains on the lighter side to create a striking contrast against the bold and assertive chocolate. Pieces of dried berries add a nice addition to the texture, adding crunchy bits of boysenberry seeds. Xocolatl 74%. Pronounced cho-co-LAH-tay, the Aztec word for chocolate (that’s where the Spanish got it from, when Cortès conquered the Aztec Empire), Dagoba’s interpretation of “spiced chocolate” may just be one of the hottest on the market. It’s intense. The nibs add a textural contrast to the smooth consistency, while the spices add extra notes to an already fruity chocolate base. You might need a glass of milk when you taste this bar, to help cool down your mouth! 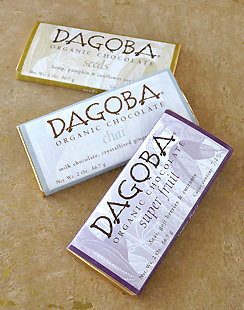 Next, you need to taste Dagoba’s interpretation of cacao in unflavored chocolate. There are nine bars to try; and in all of them, you’ll notice that Dagoba tends to prefer a slightly dark roast, characterized by caramelized notes. You’ll be able to pick out honey, caramel, raisins and other dried fruits. The style is moderate: the tongue is never weighed down by extreme boldness or prickled by intense acidity, but benefits from an intermediary approach that combines the best of both extremes for a nice balance. Texturally, the chocolate is mildly dry and on occasion grainy, but this is a stylistic choice and a charming feature that reflects cacao’s rustic roots rather than the modern super-refinement to melt-in-the-tongue velvet. You’ll find more character in these bars, similar to the great Venezuelan cacao producer El Rey, where texture is used to achieve a highly unique sensation and a truly different chocolate experience. In order of cacao percentage, there’s some pretty serious chocolate here. Almost everyone will like the 59% semisweet bar, and those who are learning to appreciate higher-percentage cacao will be able to climb the mountain to the serious peaks. Do people actually eat 100% cacao chocolate—no sugar added? Absolutely! Just a small bite at a time. Dark 59%. This is the base chocolate for many of the blends, but it’s also an outstanding chocolate bar on its own. It’s light and feminine but has fantastic flavor emphasizing diverse tropical fruits, flowers and dried fruits. It’s a perfect chocolate to eat before bedtime—for comfort, for antioxidants and because you deserve it. New Moon 74%. A much darker, stronger and slightly bitter chocolate, New Moon has a predominantly cherry body, with raisin and subtle molasses peaks to add power and character. We’re not talking about added flavors—this is the natural character of the pure chocolate blend. Eat this bar to revive weary senses! Eclipse 87%. Kicked up several notches from New Moon, this bar will floor you with its intensity and strong fruitiness. Bitter too, the bar knows no boundaries and will leave you speechless, even if you’re already into high-percentage cacao. Prima Materia 100%. After graduating from Eclipse—and do not undertake this bar until you already appreciate Eclipse—Prima Materia is Dagoba’s Mount Everest. 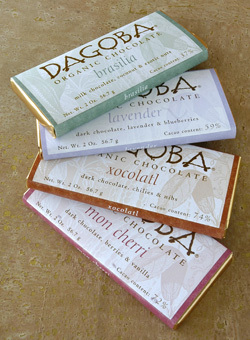 It’s the strongest, most intense and purest chocolate bar Dagoba produces (after 100% cacao, there’s no place to go). You only need a small taste of this one to feel satisfied. This bar has zero sugar, but it is not your mother’s baking chocolate. It allows you to experience cacao mano a mano. You’ll hear Jimi Hendrix ask, “Are you experienced?” After Prima Materia, you will be. Single origin bars show off the different flavors cacao takes on when grown in different regions. They are made only from the beans of the specific region, and their flavor will vary from year to year, based on growing conditions (in blended bars, the manufacturer can blend beans from a many different areas to achieve the same taste year after year). They are generally a manufacturer’s finest bars, made from the best beans a region has to offer. Conacado 73%. Spicy yet fruity, with raisin flavors, Conacado is a Dominican single origin chocolate that is also Fair Trade Certified. Being somewhat simple in its flavor, and displaying basic balance and control, this is a great chocolate to teach such lessons to students who are still learning the discipline of fine chocolate. Los Rios 68%. Hailing from Ecuador, the mighty Arriba Nacional bean is found here in an excellent interpretation of the origin. Characteristic blackberries and flowers are present, supported by a wonderful chocolate backbone that Dagoba captured brilliantly. Milagros 68%. This is a Costa Rican cru, or growing area, that’s entirely one-sided with its flavor, but still very enjoyable and comforting. Various shades of brown saturate the tongue, including golden raisins, honey and caramel, with just a subtle twang for kicks. It’s a softer chocolate that isn’t as strong as the other origins, requiring patience to unlock its rewards. Pacuare 68%. Like a light and mildly acidic coffee, this Peruvian chocolate has a remarkably fresh coffee flavor with undertones of strawberries and honey. It’s a refreshing and uplifting bar, and is an excellent example of what one means by “coffee notes” in chocolate. There’s so much coffee, you can enjoy this bar in the morning, or after dinner. Sambirano 68%. The Sambirano region of Madagascar has long been the source for fine chocolate. Other top producers make a Sambirano bar; Dagoba’s version is no less than exemplary. Blueberries and red berries make for an extremely fruity chocolate, but spices and woody accents add depth and prevent fruity overkill. A good exercise is to purchase different Sambirano bars and see how different producers work with the chocolate. 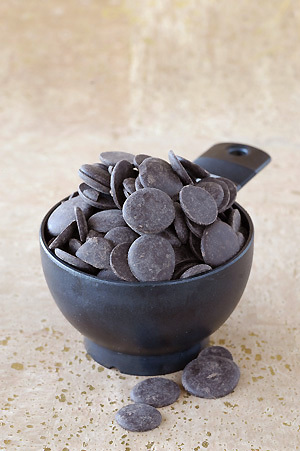 Dagoba has an extensive line of products that showcases the true essence of chocolate: cacao nibs, the seed of the fruit of the cacao tree from which all chocolate is made. After the cacao beans are roasted and winnowed (shelled), they are cracked open and the nibs are extracted, then ground and processed into chocolate—you can read about the chocolate-making process. But the roasted nibs are also delicious before they are ground, and Dagoba makes four different styles—more than other company offers, and a beautiful representation of the cacao nib, each style highlighting different sensations. The nibs come from Ecuador and are from the same beans used to make Dagoba’s single origin Los Rios bar—very fine nibs indeed! Compare the pure nib next to the finished chocolate bar for a lesson in how further processing (conching, refining, etc.) can alter the flavor of the bean. Nibs are also an excellent way to get your cacao antioxidants: Excess sugar and cocoa butter have not been added back into them, as with processed chocolate; milk and sugar aren’t required, as with hot chocolate. While the plain nibs have a natural bitterness, you may like them (similar to crunching on coffee beans). They’re delicious sprinkled in green salads. 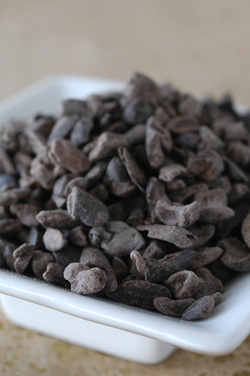 Cacao Nibs (plain, shown in photo at right). Pure and simple, these are unadulterated nibs that pack a startling punch—especially if you’re already accustomed to the Los Rios bar. Peaches and floral notes are evident here, obvious precursors to the more refined flavors you’ll find in the bar. Chocolate-Covered Cacao Nibs. These are wonderful little pebbles of joy, offering not only a soothing and sweeter contrast to the robust and less refined plain nibs, but also a difference in texture. Chewing a generous amount of these is a delicious experience, like a chocolate bar generously encrusted with nibs—hold the bar. Xocolatl Nibs. Pronounced cho-co-LAH-tay, the Aztec word for chocolate, these nibs are coated in chocolate as well, but are spiked with spices and chile for a zing that will awaken your tongue. Sweet Nibs. Munching on these is similar to eating an unrefined, crude piece of chocolate—in the positive sense, like the stage of chocolate production called chocolate mass or chocolate liquor. This is something only people in chocolate manufacturing get to experience, and while these nibs aren’t chocolate liquor (which isn’t liquid or alcoholic, but a mass of unrefined chocolate), it’s as close as you may get to the experience of it. The sugar adds a calm and very refreshing sweetness to the rough and strapping nibs, creating a product that we found especially enticing and satisfying. Specially roasted, whole coffee beans are paired with semisweet chocolate—a java lover’s delight. A sweeter chocolate has been used to counter the naturally robust beans, creating a confection that could replace one’s morning cup of coffee. Unless you take sugar and cream in your coffee, you’re all set with these little gems. The flavor is strong and hearty—more than one might expect, delivering both the intensity of unadulterated coffee and the subtle sweetness of chocolate. Personally, we would have preferred a more intense (higher percentage cacao) chocolate coating, because it would be a better balance to the strong coffee beans. But, no doubt, the sweeter chocolate has more popular appeal. 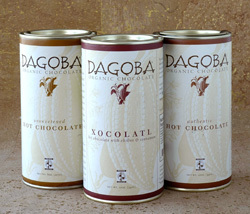 Dagoba’s mixes contain both cocoa powder and chocolate chunks. This combination creates a stronger beverage than normally produced by mixes using solely powder. The consistency is pleasantly thick yet still thin enough to not be overwhelming or too rich. The Xocolatl version contains spices and hot chiles for a fiery kick. In fact, the canister may need a warning label, informing consumers that there is hot stuff inside. This is extreme hot chocolate—possibly the fieriest we’ve tasted. If you like to bake, Dagoba has an extensive line of chocolate blocks and Chocodrops in different couvertures—perhaps the best organic baking chocolate available to consumers. Two-pound bricks and five-pound bags of Chocodrops (see photo below) are available in seven different couvertures, from milk to 100% cacao, including single origin cacao; five-pound bags of nibs and cocoa powder are also available. They’re a wonderful gift for your favorite baker; and unlike giving someone a gift of chocolate bars, might ensure that you get a cake or two in return. Self-serving gifts not withstanding, whether you buy Dagoba for your own family or as gifts for others, you’re getting fine chocolate—you’re giving to many families who farm cacao, and to the environment that supports them. Conacado 73% Chocodrops. The baking drops are also available in Milk 37%, Los Rios 68%, Milagros 68%, Pacuare 68%, Sambirano 65% and 100% Pure Cacao. Yes, while they’re shaped for baking, you can munch on them, too. Also available at fine retailers nationwide. Prices and product availability are verified at publication but are subject to change. Shipping is additional.